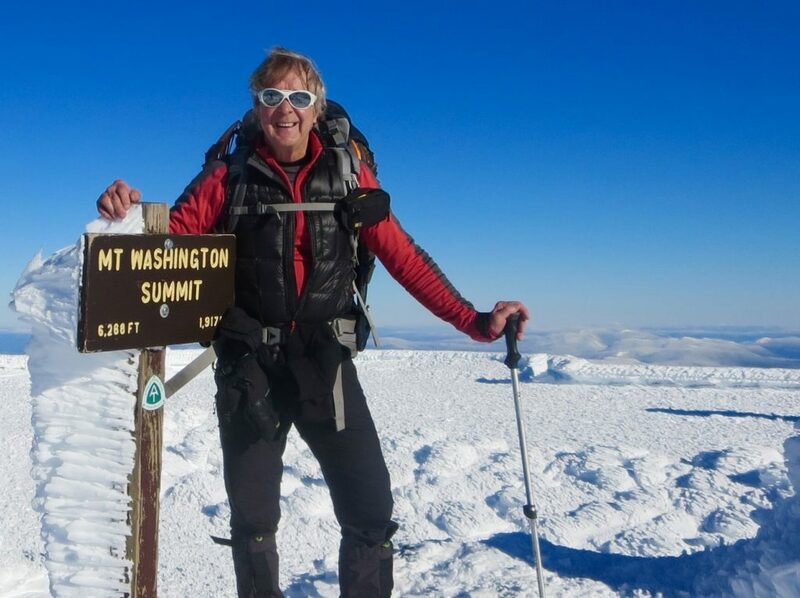 Jeffrey’s goal is to make 100 Mt Washington summits. Hopefully we can help. We are very pleased to announce the newest member of the Redline Guiding team: North Conway local, Jeffrey Shutak. Jeffrey is retired and being local may help us fill a niche for the many mid-week hikes we lead. Jeffrey is also an avid Nordic backcountry skier — which we will find useful this winter (but we don’t want to get ahead of ourselves… do look for an important November/December announcement an exiting partnership coming up this winter). Jeffrey testing out his Nordic gear. As noted, Jeffrey resides in North Conway and began his active outdoor career as a recreational runner. He moved to the Northeast to compete in road races, marathons, and triathlons in Vermont. 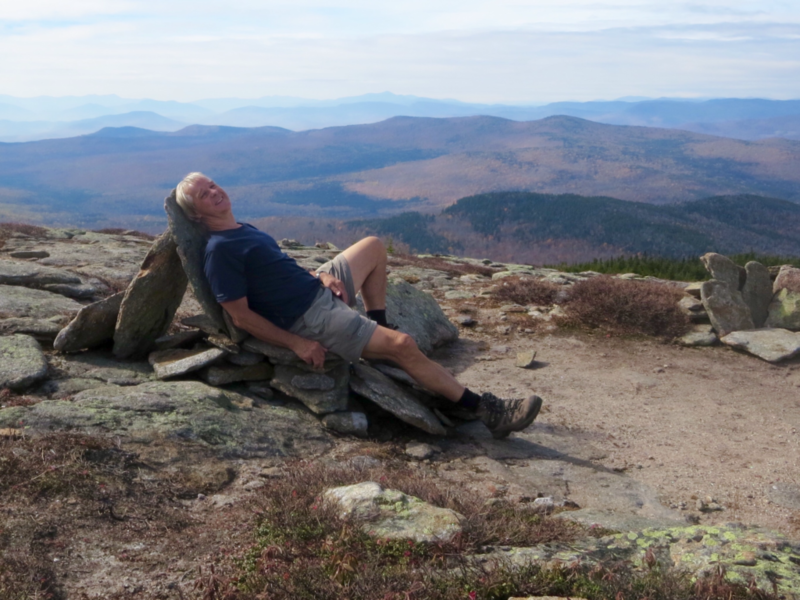 After moving to New Hampshire he discovered the beauty of the White Mountains and turned his attention to hiking, Nordic skiing, mountaineering, and rock and ice climbing. He has completed the summer and winter 48 4000-footers numerous times. 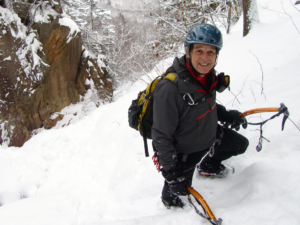 He also enjoys kayaking, Nordic skiing both track and backcountry, and biking. As a runner, Jeffrey has completed fourteen marathons including the Boston Marathon, twice, as well as numerous triathlons. He has hiked, backpacked, and ice and rock climbed all over the world. Those destinations include: The Swiss, French, and Italian Alps. A Aiguille du Midi traverse from France to Italy, Mountaineering in Chamonix including the Tour du Mt Blanc. He also backpacked in the Dolomites and summited Breithorn Mountain in Switzerland while training for a summit attempt of the Matterhorn. He has also hiked and backpacked in Botswana and Kenya, Patagonia, Cordillera Blanca in Peru and the remote area of Choquequirao (where he was robbed in the high mountains by bandits). Hiked Massif des Calanques, in Marseille, France. Backpacked the Grand Canyon twice and rafted the entire length of the Grand Canyon (two-hundred seventy miles) in 2016. Hiked the Sierra Nevadas in California. Backpacked the Coyote Gulch area of Utah, Superstition Mountain in Arizona, plus the Big Five National Parks in Utah as well as Mt Rainier… twice. 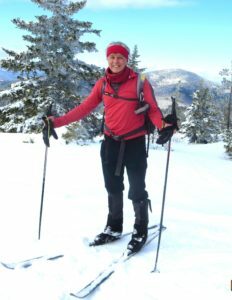 He is also an adaptive Nordic and hiking guide for New England Regional Ski for Light for the Blind and has also volunteered his time for the Lakes Region Conservation. Jeffrey also understands the importance of relaxation in the mountains. We love this! Welcome aboard, Jeffrey. We have no doubt you will be a fine member of the Redline Guiding Team!